Arrowroot (Maranta arundinacea) or “Uraro” is widely cultivated in the Philippines for its starchy rhizomes. It is a low perennial herbaceous plant with thick, fleshy and creeping roots and long white fibers and is a good source of flour. Arrowroot flour has a very high commercial value in the international market because it is best ingredients in making high quality biscuits and cookies. There is no distinct variety of arrowroot in the Philippines as this crop is grown mostly in a semi cultivated condition. However, Tiaong Experimental Station had so far collected different strains, namely: Cuenca strain, San Pablo and a foreign one from Africa. Calauan strain was discovered in 1962 at a coconut groove in Calauan, Laguna. This strain grows taller and produces more rhizomes than other known strains. Arrowroot thrives anywhere in the Philippines provided there is enough moisture in the soil for its normal growth and development. It grows best in places where rainfall is uniformly distributed throughout the year. The rhizomes are resistant to inclement weather and can stay long in the soil. They germinate in the same area where they have been planted. Soil Requirements – Arrowroot requires a friable, well drained loamy soil. However, soil at the foot of the hills, in valley and newly opened areas are preferable. Clayey soil must be avoided since it induce poor rhizome development and usually cause the deformation of the rhizome which tends to break during harvesting. It is advisable to plant this crop in an open field provided there is sufficient moisture throughout its growing period. Planting in partially shaded areas can also be done but with reduce yield. Land Preparation – Prepare the land by plowing and harrowing two or three times depending upon the soil structure. Plow deep enough to provide favorable condition for better root development. 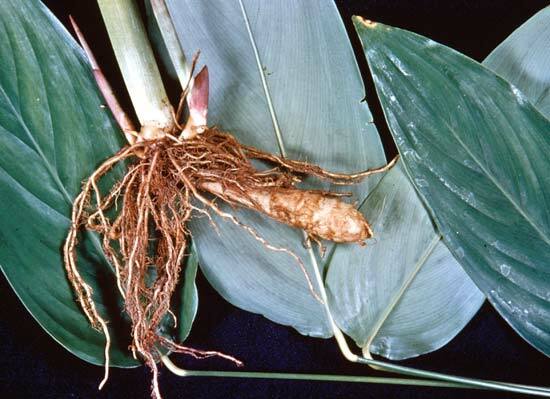 Planting – Arrowroot can be propagated by suckers and rootstock or rhizomes with two or more nodes each. Two suckers may be planted to a hill at a distance of 1.0 x 0.75 meters. Under poor soil condition, the hills should set closer about 0.75 x 0.30 meters apart. Irrigation – No irrigation needed provided there is enough moisture in the soil especially at the early stage of growth. Fertilization – The crop responds well to fertilization. In a study conducted at UPLB, yield of 18.47 tons and 26.73 tons were harvested when 90 kg/ha and 180 kg ha of nitrogen were applied respectively, while the control yielded only 12.15 tons /ha. Compost or commercial fertilizer can be applied to the plant. An application of 300 to 400 kg of 14-14-14 per hectare is recommended. Weeding and Cultivation – Simultaneous weeding and cultivation must be done during the first three to four months, depending upon the weed population in the field. Alternate hilling-up and off-barring must be employed until the plants are bid enough to cover spaces between rows. Pest and Diseases – There are several diseases found to be associated with arrowroot but only one of them is reported to occur in the Philippines. 1. Bacterial Wilt – it is a vascular wilt disease of arrowroot reported to occur in Brazil in 1962 and the bacterial pathogen was identified as Xanthomonas marantae. ===> Control Measure: Use healthy propagating materials. Planting should not be locate areas where disease has occurred and infected plants should be rouged and burned including roots. 2. Banded Leaf Blight – it was observed in North Malabar (India) in 1946 and described two years later after growers experienced considerable losses. The disease can be of some consequence under favorable conditions but has been reported only in India. Evidence of infection is small, water-soaked spots that may enlarge rapidly by the formation of successive but sometimes discontinuous, eccentric zones. Aerial mycelium quickly covers both leaf surfaces and basidia and basidiosphores are produce in the scant, whitish superficia growth. Affected leaves become completely necrotic and are rotten by a secondary organism. The disease is caused by Thanatiphous cucumesis Frank, an infectious fungus that infected leaves of several plants that include rice, corn, sugarcane and even citrus. It is reported troublesome during periods of high rainfall. ===> Control Measure: Foliar spraying (both leaf surface) prior to the onset of high rainfall season with Zineb, Maneb, or cooper fungicide using the rate recommended by the manufacturer. 3. Mosaic – is reported to occur in the Philippines but of minor importance. Symptoms are similar to that of abaca mosaic, presence of whitish small dots and narrow streaks. It is transmitted either mechanically or through an insect vector – aphids but not persistent. ===> Control Measure: Methods include rouging, selection of healthy planting materials, controlling of aphids, avoid inter planting to susceptible host and weed control. Insect Pest – Arrowroot is not normally subject to serious attacks by pest. In some arrowroot growing countries the only pest of any importance is the leaf roller, Colopedes etheus, Cram, which can easily controlled by arsenical spray. Harvesting – The crop is ready for harvest 8 to 10 months after planting. However, it was found out to produce higher yield when harvested in eleven to twelve months, with higher content of starch content (25%). Like any other root crops, it is harvested by passing a plow close to the furrows, exposing the tuberous roots, then cut-off the stem. Harvesting with the use of a fork may also be done on by pulling up the whole plant in case of sandy loam soil. The rhizomes of arrowroot, consist of an easily digested starch when extracted is a source of a dry white powder. This powder is a source of one of the purest form of natural carbohydrates. Superior quality starch is used in making a first class biscuits, pastries, pudding, cakes, native “kutsinta” and “suman”. “Uraro” a popular biscuit in Laguna is made from pure arrowroot flour. Its flour being highly digestible and able to prevent curdling is used mainly for invalid’s and infant’s milk food. It is also an excellent ingredient for thickening ice cream. The rhizomes are good rice substitute or extender. The tuberous root can be eaten when boiled or roasted before they become fibrous, and taste similar if not superior to corn. Arrowroot is also an effective substitute for corn in broiler ration. Other plant parts are excellent roughage and silage for animals. The fibrous materials remain after the extraction of starch can also used as cattle feed. Arrowroot starch also possesses demulcent properties and some times used in the treatment of diseases of the intestine. Powdered rhizomes may be used as poultice for wound and ulcers. Plant leaves are occasionally used as packing materials, while the pulp is used in the manufacture of paper, cardboard, cushions and wallboard. Next 7 Steps on How To Succeed in Your Own Business! Hi po… favorite ko po yang arrowroot nung bata ako… gusto ko po magtanim sa backyard… saan po ako pwedeng bumili ng halaman na pwede ko itanim? Taga malolos po ako… salamat po. dami kong natutunan ah! salamat po! talagang marami yang help. Because of its lack of protein, it is greatly used by vegetarians and by individuals with dietary restrictions who require less or no protein in the diet. It is specifically used as an article of diet in the form of biscuits, pudding, jellies, and cakes. In Korea, arrowroot powder is incorporated in beef tea, milk, veal broth and noodles.